"I Would Give My Life for the Prisoners in Chinese Camps"
Aiman Umarova is arguably the most famous human rights lawyer in Central Asia. In 2018, she received in Washington DC from the hands of First Lady Melania Trump one of the U.S. Department of State yearly International Women of Courage awards. Umarova looks like a quiet, kind woman, but governments in Central Asia and beyond have learned she can be a formidable foe when human rights are threatened. Since she also raises her voice on behalf of the ethnic Kazakhs who are detained as prisoners of conscience in China, the CCP has reacted in the only way it knows. It has tried to threaten and intimidate Umarova. That only made her determination to fight stronger, although she is well aware that her very life is in danger. 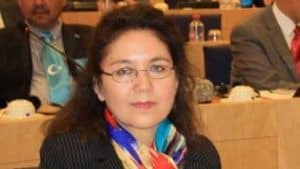 Ms Umarova, Bitter Winter has reported repeatedly about Sayragul Sauytbay, the ethnic Kazakh woman who escaped the dreaded transformation through education camps, entered Kazakhstan with a false passport in April 2018 and was arrested. Although a judge in August 2018 blocked her deportation back to China, her asylum in Kazakhstan has still not been granted. You are the lawyer of Sayragul. We know a hearing took place today [March 28]. What happened and what was it all about? There are different cases concerning Sayragul. One is her asylum application. The other is a lawsuit against the immigration department of the Ministry of Internal Affairs. We ask the court to recognize that the department acted illegally in its handling of the case of Sayragul. Indeed, there were a number of improper pressures in her case. When Sayragul contacted me and I took over as her new attorney, she was put under pressure and told she should not be represented by me. She was also asked to denounce Serikzhan Bilash, the leader of the Kazakh human rights NGO Atajurt, who is also my client. And she was constantly pressured to keep her mouth shut and not to speak out about the horrors she witnessed in the transformation through education camps. What happened to this case? It was originally scheduled to be heard February 15, however, as I applied with the court for more time to understand the details of the case, the hearing was postponed to March 11. The problem is that both the hearing in the case of Serikzhan Bilash in Astana and the hearing about my lawsuit on behalf of Sayragul in Almaty, a different city far away from the capital. I suspect the two hearings were scheduled the same day precisely to make things more difficult for me. At any rate, I attended my hearing in Astana, rushed to the airport, took a flight and went to Almaty, only to learn that the hearing had been postponed to March 28. Today we did have a hearing, but it will continue on April 8. Meanwhile, Sayragul remains in Kazakhstan with a certificate of asylum seeker, but without asylum. What will happen to Sayragul? It can still be deported, although we will fight for this not to happen. We hope she will be granted asylum. However, she is very much aware that, even if asylum is granted, her problems will not end. I believe there are certain political agreements between the security agencies of Kazakhstan and China, whose essential point is that she should not speak out about what she has seen in the camps. The most terrible part of it is that her two children, who were already in Kazakhstan with her husband when she came, are threatened in the streets by individuals who tell them there will be terrible consequences if their mother will keep criticizing China. You already mentioned the case of Mr Bilash. What is its status? It is important to understand that the two cases are connected. Mr Bilash got in trouble because of the Sayragul Sauytbay case. His human rights NGO, Atajurt, has been denied registration before, but what prompted harsher action against Mr Bilash and his arrest was the case of Sayragul, which was very much public in Kazakhstan and even internationally. Mr Bilash had always answered the request to meet the authorities and would have visited the police station spontaneously. There was no need to break the door of his hotel room, injuring him in the process, and take him forcibly from Almaty to Astana. It is also illegal to prosecute him in Astana. He carried on his activities from Almaty, so he should be judged in Almaty. This is a strong point of my defense. And what happened to Mr Bilash corresponds to a familiar pattern. He was threatened and abused as they tried to induce him to take a lawyer different from me. He resisted this but made several videos where he promised to renounce his campaigns denouncing what happens to the ethnic Kazakhs who are detained in the transformation through education camps in China. It was not a very good idea by the authorities. Everybody understood that he made the videos under extreme pressure. He told his wife and there is an audio message saying as much. I know the authorities have another video shot in similar circumstances but now are reluctant to use it, as the whole exercise may backfire. Of which, exactly, is Mr. Bilash accused? Of inciting hatred and causing trouble to public order. The authorities insist he used the word jihad when discussing what should be done to protest the imprisonment and torture of ten thousand ethnic Kazakhs in the transformation through education camps in China. He did indeed use this word. Religious scholars, however, know that the word jihad has different uses in Islam. The main use is not military or even political, it is the struggle to become better Muslims and to overcome our sins. There is also a cultural jihad, a struggle to tell the truth through articles, books, medias. Mr Bilash in his speech clearly explained that he was calling to an information jihad to make the truth known about the camps. He explicitly said he was not advocating any form of armed struggle. This part of his speech was eliminated from the videos used in court. We understand Mr Bilash is very popular in Kazakhstan. Why this persecution of a well-known human rights activist? Perhaps being popular does not exactly help Mr. Bilash in certain political quarters. But the real problem is China. Kazakhstan is under continuous Chinese pressure to silence whomever speaks out against the transformation through education camps. And China can blackmail Kazakhstan in many different ways. There are threats against Sayragul, against Mr Bilash, and also against me. I am threatened every day. But I am ready to sacrifice my life in this struggle and I will not cease to tell the truth. Actually, I believe at this stage it would be more dangerous to keep silent. If we speak out and present our case internationally, the CCP may be more reluctant to extend its long arm to Kazakhstan and take extreme measures against us.